Fire rated doors are critical to saving lives in the event of a fire in public or commercial buildings and Regulatory Reform (Fire Safety) Order 2005 puts the responsibility for the fire safety of properties under the control of building owners or managers. However, establishing fire rating of an existing door and ensuring its reliable performance in the event of a fire is not always straightforward, as doors get damaged, records may not be complete and markings on doors get lost. This can potentially lead to increased maintenance costs, as in the case of not being able to trace the door’s origin and manufactured specification, the ‘Responsible Person’ carrying out fire safety assessments may be forced to condemn the door. This door then needs to be replaced as a matter of urgency, when fire safety is involved, you have to act quickly. One of the ways of ensuring satisfactory performance of a fire door and its traceability is sourcing products from manufacturers offering third party certifications. At CS we decided to go with the BM TRADA Certification scheme, now our impact resistant CS Acrovyn Fire Rated Doors & Doorsets are certified with a BM TRADA Q-Mark. The BM TRADA Q-Mark provides building owners with the peace of mind that CS Acrovyn Doors & Doorsets have been rigorously tested, appraised and manufactured to a consistently high standard. As part of the BM TRADA Q-Mark process integral markings are embedded in our doors so when it comes to a future audit, building owners will still be able to determine a fire door’s rating and its manufacturer. We are pleased to be able to offer BM TRADA Q-Mark certified 30 and 60 minute Acrovyn Fire Doors & Doorsets, which are clad in our impact resistant Acrovyn material and are available in a wide range of configurations, frame, glazing and beading options to suit any application. Why choose CS Acrovyn Doors? On top of the third party certification, CS Acrovyn Doors give building owners the peace of mind that the door will stand up to rigorous use and abuse from trolleys and pedestrians. Acrovyn adds an impact protecting and easy to clean surface to the door, reducing the need for costly maintenance or replacement of the doors. With Fire Doors it is especially important to keep them in good condition, not only because they are expensive to replace, but also because even the slightest defect in the door can compromise the door’s integrity and its ability to perform in a fire. 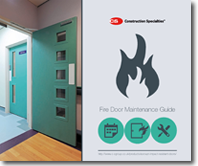 We’ve produced a helpful guide to fire door maintenance which you can download from our website here, taking into account advice from British Standards and real O&M Manuals.